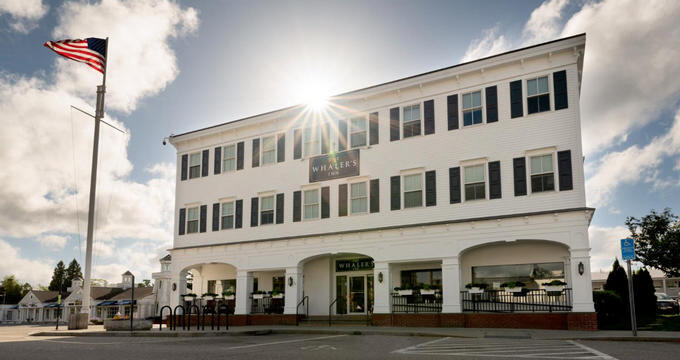 The Whaler’s Inn is located in Mystic, Connecticut and is proud to be Mystic’s largest downtown boutique hotel. Whaler’s Inn can be found just a few feet away from the Bascule Drawbridge and the Mystic River, making its magical location and recently renovated rooms and suites the ideal place to find comfort, tranquility and relaxation. -Main Inn Premiere Guestrooms – These featured guestrooms boast a more spacious room layout along with the many windows that provide guests with a view of historic Mystic downtown. In each room, guests can find either a queen-size or king-size bed, as well as an extra sleeping area for additional guests. This additional sleeping area can vary from a king trundle bed to a single pull out, depending upon the room. For more specific details about the Premiere Guestrooms, guests can contact the Whaler’s Inn. -Main Inn Junior Suite – This Suite was designed specifically with kids in mind. Guests can find a queen-size bed for adults in the main area as well as youth bunk beds in the separated alcove space. The kid alcove area includes a television complete with exclusive Roku access. The Main Inn Junior Suite includes a bathroom with combined bath/shower. -Main Inn Queen Guestroom – This guestroom varies in size, however averages at about 300sf. The Queen Guestroom features a bathroom with a wall mounted TV. Guests can also take advantage of complimentary Internet and cable television during their stay. Unique design features and accommodations of the Main Inn Queen Guestroom include tin ceiling, candlestick phones and Crossly radios. -The Hoxie House Deluxe Guestrooms – These 400sf guestrooms were designed with romance in mind, featuring a soaking bathtub, gas fireplace and views of the Bascule Drawbridge and Mystic River. Guests can choose either a queen or king-size guestroom. All other standard amenities and accommodations, including flat screen televisions, in-room refrigerator and gas fireplace, among others, are included in The Hoxie House Deluxe Guestrooms. -Stonington House King/Two Queen Guestroom – Known for its quieter, more tranquil location, these guestrooms feature a king-size bed or two queen-size beds with a spacious double stall, hand tiled shower. The Two Queen Guestrooms can be found on the first floor of the Whaler’s Inn, with close proximity to the parking lot. Guests at the Stonington House can enjoy both a quiet location as well as views of Mystic downtown. These rooms are 300sf and include all of the standard amenities and accommodations offered at the Whaler’s Inn. -The Noank House – At this House, guests can choose between two different room layouts. The first option includes two queen-size beds and the second option includes a king-size bed with a full-size sofa sleeper. Guestrooms at the Noank House are unique for their large, inviting porch entrance. These rooms are approximately 300sf and also include all standard amenities and accommodations offered at the Whaler’s Inn. -Red 36 – This restaurant is famous for its featured seafood platters. Named the “Seafood-centric” hidden gem of Mystic, Connecticut, guests are guaranteed to find something to satisfy their taste buds. Outdoor seating is available at the Red 36. Guests overlook the great Mystic River while they dine. -Engine Room – This restaurant is most popular for their bourbon and beer collection. Diners from all over also continue to return for their famous Sunday brunch. -Bravo Bravo – This restaurant is located on-site at the Whaler’s Inn. Bravo Bravo has a Northern Italian style cuisine and an extensive wine collection. The Oyster Club – This restaurant is located on Water Street, and is most loved for its casual yet elegant dining atmosphere. Guests can dine assured of their farm-to-table prepared food, full of fresh, organic ingredients. Chapter One Fine Food and Drink – This restaurant is located on Main Street. Its menu features small plates, freshly caught fish and dry-aged prime steaks. Margaritas – This restaurant is the ideal balance of kid-friendly and adult meals and beverages. Its cuisine provides diners with the authentic tastes of Mexico in Mystic, Connecticut. Pizzetta – This pizzeria is known for its uniquely prepared handmade pizzas, many of which are dairy-free and gluten-free. The chefs at the Pizzetta are always aware of diners who may have food allergies, limitations or dietary restrictions. Pizzetta can be found on Water Street.